When professional illustrator Karim Terouz left his hometown of Cairo at the age of 25, he not only made the ballsy decision to brace the blistering Canadian winters, he also chose to seek out a whole new career path in Montreal, QC. Turning to his true passion – music – Terouz began visiting every open mic night imaginable, which is how he came to discover Hubert Tremblay (Guitars) and Andrew Sudlow (Bass), the rest (Isaac Gesse on Trumpet and Harvey Bienaime on Drums) followed through to complete The Rising Few. Fusing raspy rock vocals with rhythm & blues, visceral lyrics and dark undertones, The Rising Few deliver a heart wrenching, commanding vibe to every room they play. As if The Dave Matthews Band crossed with Audioslave, Interpol with Bruce Springsteen and The E Street Band or even Yusuf Islam/Leonard Cohen crossed with The National for a more intimate ambiance dominating a live stage with a high octane, fully emotional rock show. After multiple live shows and a first place win at the LME showcase competition (http://www.landmarkevents.net) in which the band beat out 200+ others for top honours, The Rising Few unveiled its first album in 2014, ‘Sinners On St-Laurent’ that was produced by the great Glen Robinson whoms mixing and mastering credits have been involved in projects with Dave Grohl’s Probot, The Ramones, The Steve Miller Band, David Bowie, AC/DC, Keith Richards, The Tea Party, Ringo Starr, The Beach Boys and many more over the course of his career. 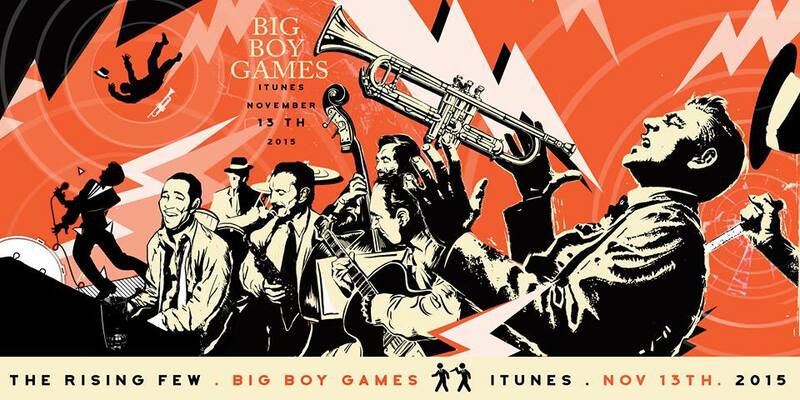 In Fall 2015, November 13th the band returns with their new single ”Big Boy Games” tapping the talent of producer Glen Robinson once again to be behind the board to aid the band create a complete left turn from their folky, acoustic beginning to make The Rising Few’s sound to a more melodic rock song with Terouz’s commanding vocals clearly brand the band with a global appeal.